Which isn’t actually that unusual — protest is sort of JNU’s thing. A legendarily left-leaning campus, JNU is known and loved and bemoaned across India (and the world) for its progressive student politics, open atmosphere, intellectual rigor, and culture of debate. But this time, as students, teachers, and supporters staged a human chain around campus more than a kilometer long, JNU Student Union president Kanhaiya Kumar sat in police custody, having been arrested under a colonial-era sedition law. Five other campus activists, including present and former JNU Student Union (JNUSU) central panel members, have also been charged with sedition. Eight students, including Kanhaiya, have been suspended from the University without an inquiry. Students and teachers are both currently on strike. “The unity of the people of different parts of the country in challenging divisive, authoritarian, anti-people and anti-student forces is what we stand with and look up to,” reads a February 13 statement of the JNU Student Union, condemning administrative and police action against students. As teachers and students stood arm in arm in protest Sunday, police stood at the campus gates. India has long been a place of incredibly vibrant intellectual, political, and social freedom of speech. But the charges, arrest, and police presence against student political expression at JNU come after rising concerns on the part of students and intellectuals about the BJP central government’s actions against campuses. 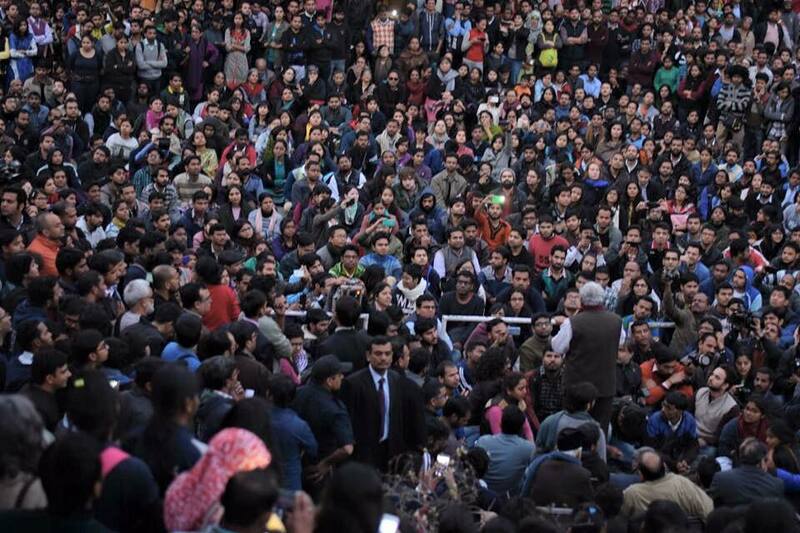 The backstory to the JNU students’ protest is a long one, and you should hear it. It’s a story about struggles over secularism and intellectual freedom in contemporary India. It’s a story about the global importance of student movements. And it’s a story we in the the U.S., in our own election season full of Trumpery, demagoguery, and racism — and, on the other side, potential progressive change — need to listen to. In May 2014, the right-wing Bharatiya Janata Party (BJP) came to power. Running a campaign based on promises of development, prime minister Narendra Modi’s party gained substantial numbers of seats across the country. The BJP’s ideology is marked by several things. It is a pro-corporate party, inclined especially toward multi-national corporations. And it is a Hindu nationalist, or Hindutva party, meaning it advocates for Hindu cultural dominance in the religiously and culturally diverse subcontinent. It is backed by outlets such as the militant Hindu right-wing RSS, which has been described as a terrorist organization, and is associated with some famous episodes of communal violence. Prime Minister Narendra Modi’s political career has also been associated with communal violence. Modi was Chief Minister of the West Indian state of Gujarat in 2002, when anti-Muslim rioters killed, raped, injured and destroyed the property of thousands of people, most of whom were Muslim. A number of state government officials were found guilty of involvement in killing Muslims during the riots. Modi himself was found innocent of foul play by the Indian Supreme Court, though some human rights groups remain skeptical. Modi was for a time officially denied a visa by the United States for offenses to religious liberty. Since the BJP government came to power in 2014, India has seen several communal incidents, including religiously-motivated beef bans and the lynching of Muslim people “suspected” of eating beef. Right wing groups have also continued the practice of harassing young people in cross-religious relationships, spreading false information about so-called “love Jihad” in which Muslim men supposedly target Hindu women. There have been countless similar incidents. There has also been concern among artists, academics, and intellectuals regarding a growing climate of intolerance for open inquiry. In the past three years, three rationalists – who opposed Hindu hegemony — have been murdered. This climate has motivated a number of prominent intellectuals across India to give back their government awards. The BJP’s student wing, the ABVP, whose popularity in student elections swelled following the victory of its parent party, has been active on college campuses — even winning one of four central panel seats in the historically leftist JNU. First stepping onto JNU’s campus two years ago felt like falling in love, like stepping into the potential of a better world. JNU occupies a sprawling jungle campus in the southwest corner of Delhi, acres of hills and red sandstone and dust that gets on your feet your hands your everywhere. In the warm weather students come out of their dorms when the heat has gone to sleep and drink tea and sing and talk, talk, talk. JNU, like any institution, has its problems: Entrenched gender and caste inequality, petty politicking, sometimes the chai stands run out of samosas. But what makes this place so goddamn special — what made me, and what makes most people who know it, swoon — is its thriving campus democracy. “Yeh university ek khatarnak jaga hai,” “This university is a dangerous place,” said Sucheta De in a speech at a protest meeting on February 14, citing the challenge to convention, particularly gender norms, posed by the university’s progressive atmosphere (translations my own). De, a former JNUSU president, is current national president of the student wing of the Communist Party of India Marxist-Leninist Liberation (CPIML). “Yeh baat bolte hain mujhe rona aata hai, ki yeh freedom, yeh equality, yeh liberty — main mahila hun, main insaan hun — aur absolutely equal hun.” “When I talk about this I feel like crying — this freedom, this equality, this liberty. I’m a woman, I’m a human — and I’m absolutely equal” at JNU, De said. The JNU Student Union (JNUSU) is a body with an incredibly robust history of autonomous student governance. Consisting of elected student representatives from various campus political parties — most of which are wings of national parties, and most, but certainly not all, of which are communist — the Union frequently leads student movements in India, campaigning for social justice of all kinds. There have been several such student movements under the current government — and several instances of central government pressure against students and intellectuals. In April, the Indian Institute of Technology in Madras de-recognized the Ambedkar-Periyar Study Circle, a group of mostly Dalit — the most oppressed caste in Hindu society — students committed to spreading the ideas of Dalit writer of the Indian constitution B. R. Ambedkar. The move, coming after the central education ministry expressed concern about Dalit students’ critique of the central government, prompted widespread condemnation among students, and was revoked. In June, the central government appointed Gajendra Chauhan, a BJP party affiliate, Vice-Chancellor of the Film and Television Institute of India, the country’s premier cinema school. Students protested the appointment of a man they felt wasn’t fit for the job — and the RSS branded them “anti-Hindu” for doing so. Progressive students across the country expressed concern over increasing patterns of right-wing encroachments on university spaces. In October, the Ministry of Human Resource Development (MHRD)’s University Grants Commission voted to discontinue the fellowship funding M.phil and Ph.d students had been receiving from the central government. This came in conjuncture with India’s greater move toward the privatization of education. In December, India signed a World Trade Organization (WTO) agreement labelling education a “tradable commodity,” meaning a reduction of the historic protections afforded Indian educational institutions and an opening of India’s doors to neoliberal educational models and foreign education providers — a move that is sure to drastically limit educational accessibility. Students protested fellowship cuts and the WTO talks in the #OccupyUGC movement. In mid-January, a Dalit research scholar at Hyderabad Central University, Rohith Vemula, committed suicide. Rohith’s suicide followed the University’s expulsion of him and four other members of the Ambedkar Student Association (ASA), a Dalit organization, after an alleged altercation with BJP activists on campus the previous August. The expulsion occurred after a central government minister pressured Hyderabad Central University to deal with the supposedly “anti-national” and “casteist” students — Rohith and his friends. The branding of Rohith and the ASA, who advocated for the rights of Dalit students against upper caste oppression, as “casteist” and “anti-national,” is a move against their fight for both caste equality and student voice. Following Rohith’s suicide, students across the country joined in protest of the government’s harsh stance toward the students, and for caste justice. The student protestors were greeted with beatings from the police. JNU students joined — and helped lead — these protests. JNU students join and lead many student protests. Students like Rohith and students like Kanhaiya — who have come from poverty and caste oppression to become research scholars and student leaders — join and lead these protests. And advocacy for debate, for social justice, for heterogeneity, for the voice of the marginalized has long threatened established power. Stifling the intellectual and political power of the JNU student union, student body, faculty, and staff is effectively a gesture to Indian student movements. What led up to Kanhaiya’s arrest? Last week, a small group of JNU students put on an event questioning the hanging of Kashmiri separatist Afzal Guru. Guru was convicted and hanged in 2012 for his role in the 2001 Indian Parliament attacks. Some lawyers and human rights activists continue to raise questions about the validity of his trial. The JNU administration, who had given the students permission to stage the event, withdrew this permission at the last minute in response to a complaint lodged by the sole ABVP member of the JNUSU central panel. Progressive JNUSU members, according to their subsequent statements and student reports, came to the event, which was protested by the ABVP, in support of the students’ right to host it and to monitor the situation in order to ensure violence did not break out. Later that night, a complaint was lodged at the local police station that anti-national slogans had been shouted at the event. By Friday, Kanhaiya was arrested, six students were slapped with sedition charges, and eight students were expelled. Police were stationed across campus and entering student dorms. By Saturday, more than 2500 students, professors, and community members had gathered on campus to protest in a human chain that stretched over 2 kilometers. Shehla Rashid, JNUSU Vice President, responded by questioning the motives of the arrest. What’s the Story with Sedition? Here are some things you should know about sedition law in India, and here are some other resources you can consult to learn more. Sedition is an unbailable offense. It is punishable by up to life in prison. Sedition charges continue to be lodged against dissenters in contemporary India — including, for example, popular author Arundhati Roy, charged with sedition for expressing her views on Kashmir. A case was even recently lodged against popular Bollywood actor Aamir Khan, who expressed fears on rising intolerance. Contrary to the way that sedition law is used by police and the lower courts, the Indian Supreme Court has repeatedly written that one can only be convicted of sedition if one’s speech incites others to violence. One cannot be convicted of sedition if one says something unpopular, offensive, controversial, or “anti-national.” One cannot be convicted of sedition for questioning whether someone convicted of terrorism is actually a terrorist. One cannot be convicted of sedition even if one advocates violence. To be convicted of sedition according to Supreme Court precedent, you need to be proven to have incited violence. Under the Supreme Court’s understanding of sedition law, neither the organizers of the event, nor the other activists present — whether they said the slogans or not, and all major student political parties have come out condemning the slogans — can be convicted of sedition. This whole country demands freedom from the WTO. This whole country demands freedom from casteism, from the casteism because of which Rohith Vemula was made to take his life. We demand freedom from gender discriminatory laws. -JNUSU Vice President Shehla Rashid in a speech at student protesters. Over the past few days, JNU’s campus has become a public opinion battleground. As social media — and conventional media — explodes with accusations that JNU students are terrorists, statements from students, academics, artists, human rights activists, politicians, intellectuals, Amnesty International and people of all stripes have come out in favor of the striking university community. On Saturday, several Parliament members, prominent activists and intellectuals, and Congress Party Vice President Rahul Gandhi came to campus to support the protesting students, affirming the issue as one of national political importance. A small but vocal group of ABVP students attempted to provoke and disrupt the proceedings, chanting and waving black flags to show their disapproval of Gandhi, who met them with a speech on the importance of people raising their voices. “People who showed black flags on my face, I feel proud that in my country they have the right to show black flags,” Gandhi said. Even as the ABVP student group pushed into the crowd, reportedly physically aggressing on an MP, a group of professors formed a human chain around the meeting. At a moment of high anxiety, with an institution that has allowed them to learn, grow, question everything, play cricket in the evenings, under threat, students sat and listened, the bodies of their teachers between them and those attempting to provoke them to violence. And make no mistake: The bodies of students and professors are at potential risk. On Monday, the first day of strike, as hundreds of students gathered at the JNU administrative block to continue meetings, Kanhaiya appeared before court. Teachers who went to support him were roughed up by right wing lawyers — pushed and physically beaten — inside the court of law. Students and journalists were beaten by right wing groups outside. Journalists have since protested the assault and police inaction. Kanhaiya will appear again in court on the seventeenth. JNU students and professors continue to strike. As an American, I know a thing or two about nationalism. I know how, in the United States, in the name of nationalism we are not supposed to have birth control, and in the name of nationalism we’re not supposed to want to shut down Guantanamo. In the name of nationalism we are supposed to turn away Syrian refugees and in the name of nationalism we are supposed to build walls against immigrants and in the name of nationalism we are supposed to disregard Black lives. Here is what I also know: I have never seen a group of people so singularly determined, so singularly mutually supportive, so singularly oriented toward community, as I have seen JNU students in the past few days. JNU doesn’t inspire so much loyalty in those that love it because students feel some kind of jingoistic obligation toward the institution. JNU inspires loyalty because its democratic student culture demonstrates that human community is a verb: It is a collective act of learning to live together, of learning in order to live together; of learning to change the world and of learning in order to change the world. 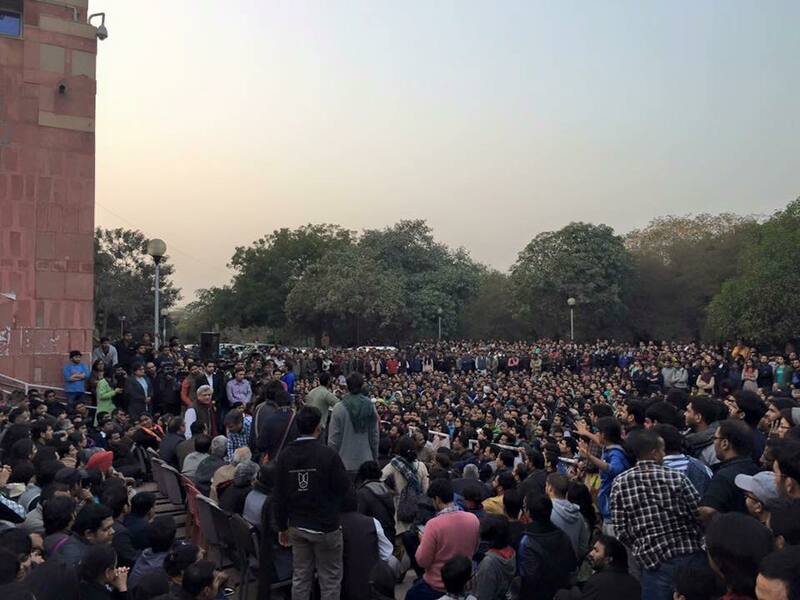 As the police stood at the gates of the university, students continued to sit under the smoggy Delhi stars and speak. Academics and intellectuals from all over the world have spoken out in favor of the striking teachers and students of JNU. Their statements are below. Readers can support the students by tweeting under the #standwithJNU hashtag. Violence Against Women Is Cemented in Urban Infrastructure. We Need #CitiesForWomen. With its population of nearly 1.5 million, my hometown of Madurai, India, is a city rich in history, culture, and proud traditions. But like many large cities around the world, it also is a place that can be unsafe for women.